Jayarava's Raves: Asoka, Pāli, and some red herrings. Asoka, Pāli, and some red herrings. A few weeks ago I read a reference to a book on Indo-Aryan languages. I found the book in the University library and was immediately struck by the entry on Pāli. Pāli, the book says, is essentially a western Middle Ind0-Aryan dialect. This raised a number of questions for me if only because the Buddha lived in the East of India. So what was going on? The Indo-Aryan languages are divided roughly into three periods. Old Indo-Aryan (OIA) is represented by the Vedic language of the Ṛgveda, but includes Classical Sanskrit. The Middle Indo-Aryan (MIA) languages began to appear in inscriptions around the time of the Buddha - circa the 5th century BCE. These are often referred to as Prakrits and include Pāli. Although it's often assumed that all Indo-Aryan languages can be traced to Vedic, this is unlikely. Pāli and other Prakrits have antecedents in archaic OIA languages which existed in parallel to Vedic, but which are no longer extant. New Indo-Aryan (NIA) languages are the modern North Indian languages such as Hindi, Gujarati and Bengali. 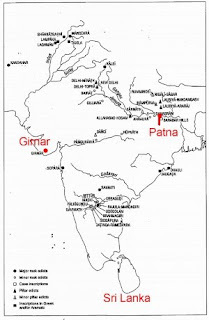 The claim that Pāli is a western MIA dialect rests on its similarity to an Aśokan rock edict in Girnar (in modern day Gujurat). Girnar incidently was originally Girinagar or "Hill Town". This similarity between the Girnar edict and Pāli seems to have been originally noticed by Ettiene Lamotte. King Aśoka (c 272-231 BCE), whose empire centred on the town of Pāṭaliputra (present day Patna) had a number of these edicts carved into rocks around India, and also made some impressive stone pillars which carried inscriptions. The inscriptions cover a range of subjects including Aśoka's renunciation of violence, and his desire that everyone should live by the "dhamma". History tells us that Aśoka's grandfather, Chandragupta, had become a Jain ascetic late in life and it seems as though Aśoka might have emulated him in becoming a Buddhist. The edicts are carved in a number of languages. In Bactria and Afghanistan they are in Greek or Aramaic because these were the local languages - legend says that Chandragupta Maurya was inspired in part by glimpsing Alexander on his rampage through Asia and into India, and it was Alexander who left Greek speaking people behind in that region. Aramaic was a relic of the Persians whom Alexander defeated. The other edicts are in forms of MIA. In Gāndhāra, the north-west of what is now Pakistan, the local dialect is now known as Gāndhārī. In the west another unnamed dialect was used. Finally in the east and south edicts were carved in what has come to be called Māgadhī - the language of Māgadha, and presumably of Aśoka himself. It is usually said that Aśoka himself sent missions to far flung places to spread Buddhism, and especially that he sent one of his sons, Mahinda, down to Sri Lanka. The connection with Sri Lanka is very important because it was there that the texts were written down in Pāli. So at first glimpse it seemed that there was a puzzle here: why would Aśoka send missionaries bearing a collection of texts in a strange dialect? Why weren't the texts in Māgadhī? Theravāda legend says that Pāli is Māgadhī, but this idea has not been taken seriously by scholars for some decades. The view finds authoritative support in Salomon's Indian Epigraphy where he reviews the writing in the Aśokan edicts. So until quite recently there seemed to be a consensus that Pāli was not Māgadhī and that it most closely resembles the language of the Girnar edict which is in the west, in what is present day Gujarat. So I began to construct a scenario which would account for this. Firstly I wondered whether the texts were in Pāli when they arrived in Sri Lanka - there is no account of their having been translated however. Next I discovered the traditional account in the Mahāvaṃsa, chapter thirteen of which tells that Asoka spent time in Avanti - a western province - where he was governor before taking up the throne in Māgadha. Here he had his son Mahinda with a local woman. Could this account for the language? I later discovered that Mahinda's origins in Avanti had already been considered as an answer to the language problem by Ettiene Lamotte (this is cited in one of K.R. Norman's many articles on the subject). I also began to explore the history of the time. Asoka was not the last emperor of the Mauryan dynasty, but it did not long survive his death. And inscriptions in Māgadhī cease around this time. The Mauryan dynasty continued for a few decades until the last Mauryan king was assassinated by one of his generals who then founded the Śunga Dynasty. The Śungas are obscure but thought to be Brahmins who came from none other than the Avanti area in western India. It began to seem likely that the Śungas might have spread a western dialect into the East, and helped it to become the lingua franca in the last two centuries BCE. In fact the western dialect is found as far afield as Orissa and Amarāvati. This seemed quite a likely answer to the question until I received replies to queries which I had sent to Dr Lance Cousins, and Prof. Richard Gombrich. Both said that the scholarly consensus is that Pāli is in fact Māgadhī, albeit heavily Sanskritised, and that Girnar also is best explained as a Sanskritised and partially localised version of Māgadhī. They both recommended reading more of K. R. Norman's recent work on this subject. This is no great hardship as Norman is a fascinating writer. What Prof. Norman did was to compare in minute detail the language, spelling and writing of the edicts and construct a scenario which could account for the similarities and differences. Norman points out that the features of the Girnar inscription were not confined to the west, and that in fact there are many differences between the Girnar inscription and Pāli. In spoken language there was a general movement away from Sanskrit, with each local dialect or Prakrit changing at different paces. Different features of dialects could change at different rates as well. But at the same time Sanskrit was a powerful literary influence so that written texts were Sanskritised, or made to conform more to Classical Sanskrit. Asoka's edicts were written texts. Most likely they were dictated to a scribe who then made copies to be sent out to the regions to be carved into stone. Some edicts are clearly made from the same original, but show considerable variation in the skill and attention to spelling of the scribe or stone mason. Sometimes a local scribe has modified the original to be more Sanskrit, or more like the local dialect, and sometimes both. Sometimes he was just kak-handed, and sometimes working in a confined space that distorted the letters. So it seems that the mystery is solved and ironically that the Theravāda legends were right all the time. Pāli is Māgadhī. Although over the years the written form of Pāli has been Sanskritised. This was partly under the influence of Sanskrit inspired Pāli grammar texts from Burma. We do know that Pāli continued to evolve because Buddhaghosa's Pāli is noticeably different from the language of the suttas. We seem to have conflated two stories here which when one reads the evidence closely are distinct. Why? Norman speculates that it is because scholars have not read the edicts themselves and so are lead by other writers (who themselves may not have read them). Unless we make the effort to learn the languages then there is no way for us to know for ourselves! This whole subject is a fascinating case study in the dynamics of scholarship of this type. This has all happened within my lifetime. It shows that just because something is in a book, even what appears to be an authoritative book (such as an impressive university text on languages), and backed up by other authoritative sources, it must still be evaluated. It is possible even for careful and talented scholars, familiar with the languages of the texts, to be in error - how much more so for those with no Pāli, Sanskrit or Prakrit (etc) relying on others to interpret texts for them. It shows how difficult it can be to be well informed on a subject, although writing in 2003 I wonder if Cardona and Jain can really be excused for not being cognisant of Norman's articles. The Pali Text Society have conveniently collected Norman's articles into eight hard bound volumes but these are not likely to be in your local library. Many of the articles are quite readable, but it's better to have some background in Indian history, geography, and languages. Not many of us have the time or inclination to do what needs to be done, so we have a tendency to propagate urban myths and hearsay. Cardona , George and Jain, Dhanesh (eds). 2003. The Indo-Aryan Languages. London : Routledge. Salomon, Richard. 1998. Indian epigraphy : a guide to the study of inscriptions in Sanskrit, Prakrit, and the other Indo-Aryan languages. Oxford University Press.